Director Bong Joon-ho‘s Okja (옥자) is almost upon us. The highly anticipated science-fiction/drama is set to premiere In Competition at the Cannes Int. Film Festival on May 19th, before appearing on Korean cinema screens around June 28th – and across the world, thanks to Netflix. The film tells the story of Korean youngster Mija and her best friend, the enormous hippo-esque animal Okja, who have lived peacefully in the mountains for the last 10 years. 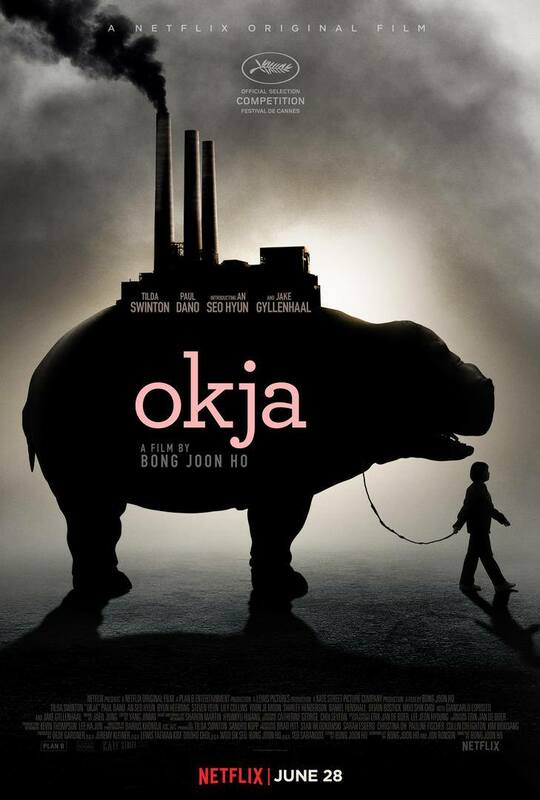 Yet when the Mirando Corporation abducts Okja to New York for their own nefarious schemes, Mija embarks on a quest to save her friend and bring her home. Director Bong is no stranger to films of this nature, having helmed monster movie The Host and exploring the dark side of capitalism in Snowpiercer, however Okja looks set to be an altogether new animal. In recent interviews, director Bong has stated that, “Netflix guaranteed my complete freedom in terms of putting together my team and the final cut privilege, which only godlike filmmakers such as Spielberg get” (Sonia Gil; Variety). Such a statement is a cause for celebration, as well as – perhaps unintentionally – eluding to the difficulties director Bong had with The Weinstein Company for the final cut of Snowpiercer. Okja has also courted controversy due to the Cannes Film Festival rules regarding theatrical distribution. French exhibitors are angry that certain films, particularly those from streaming services such as Netflix and Amazon, are not bound by the strict theatrical release rules that exits in France, prompting the festival to alter requirements for selected works from 2018. However at a press conference in Seoul director Bong and Netflix chief content officer Ted Sarados did not seem to mind the controversy, with director Bong stating, “I anticipate even more explosive talk about the film’s story itself,” he said, noting it could be seen as political satire, but also “my first love story – between a girl and an animal” and how we live with animals “as friends and family, and as food.” (Jean Noh; Screen Daily). Director Bong Joon-ho‘s (봉준호) highly anticipated science-fiction epic Snowpiercer (설국열차) has been in some form of development since 2004 and, nearly a decade on and sporting a $40 million price tag, finally gets a release. Currently the most expensive Korean film ever produced, featuring an international cast, and with around 80% of the dialogue in English, the film represents quite a risk for CJ Entertainment. They need not worry however, as the futuristic thriller is a darkly brilliant and enthralling experience. Based on the French comic book series Le Transperceneige, director Bong’s adaptation is a keen and intellectual exploration of humanity and the class system set within the confines of a train. Yet it is also a violent and visceral action thriller, as tensions boil over among the last vestiges of humanity with shocking brutality. 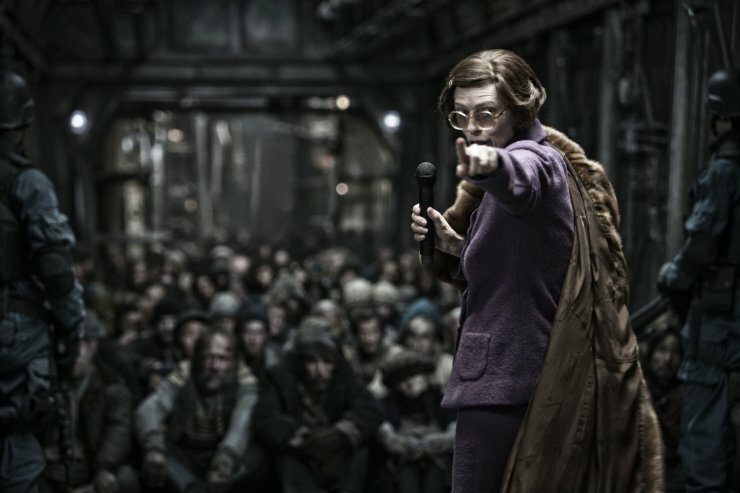 While not perfect, as the lack of character development, often predictable twists, and unrefined CGI let the film down somewhat, Snowpiercer is still a veritable thrill ride and certainly one of the best films released so far this year – by Korea or Hollywood. In the near-future, global warming has become such an issue that the governments of the world convene and agree to release a cooling agent into the atmosphere. The experiment is a colossal failure, as the attempt plunges the world into another ice age, killing all life on the planet. The last vestiges of humanity live onboard the perpetually moving train ‘Snowpiercer’, with the passengers designated by class; the affluent live in privilege in the front carriages, while the poverty-stricken live in the rear. Angry at the unfairness and squalid living conditions, Curtis (Chris Evans) – along with protege Edgar (Jamie Bell) and mentor Gilliam (John Hurt) – lead a revolution against sinister matriarch Mason (Tilda Swinton) in order to control the engine invented by Wilford (Ed Harris). Yet to do so they will need the help of security specialist Namgoong Minsu (Song Kang-ho (송강호) and daughter Yona (Ko Ah-seong (고아성) to unlock the gates. Snowpiercer, arguably more than any of his prior films, reflects director Bong’s incredible visual and spatial prowess. Throwing the audience immediately into a period of revolution, director Bong conveys a world of dirt, squalor and confinement to wondrous effect. The dystopian arena is intensely claustrophobic and acutely portrayed as the camera weaves around the environment introducing the suppressed population, while the darkness removes any sense of hope. Such powerful atmospherics generate palpable tension as the corruption and hypocrisy of the class system are exposed, recalling classics such as Lang’s Metropolis (1927) as well as the contemporary economic situations in the west, which resonate deeply. Yet the real masterstroke of the clearly Marxist-inspired story lies in the journey to the engine. Each carriage door opened unveils a startling new layer of the hierarchy that leaves the revolutionaries – and audience – dumbfounded, and each is a triumph of design. Director Bong and production designer Ondrej Nekvasil have crafted unique and spectacularly bizarre worlds within each arena, from the sugary-sweet Disnified classroom through to a hellish costume party, each a stunning visual indictment of the social elite. In bringing the worlds within Snowpiercer to life, the ensemble cast are terrific and perfectly suited for their allotted roles. Tilda Swinton stands out as she superbly channels Margaret Thatcher-esque conservatism into the character of Mason, while Alison Pill’s fanatical school teacher is great despite short screen time. On the Korean front Song Kang-ho is highly entertaining as junkie engineer Minsu, and is given some of the best in-jokes within the film particularly regarding untranslatable Korean curse words. Ko Ah-seong fares well as Minsu’s daughter Yona, although the story involving her character isn’t really given a chance to develop. Ultimately with so many quality performers within Snowpiercer there is little room for any character save Chris Evans’ Curtis to grow, however his subplot is predictable while speeches about the past would have provided greater impetus had they been shown and not told. As several narrative tangents are left unanswered, a director’s cut of the film would be a blessing indeed. Yet this underdevelopment is primarily due to the breakneck speed in which the film advances. The whirlwind pace of Snowpiercer is simply incredible from start to finish as the revolutionaries battle to reach the front of the train, attempting to overcome the onslaught of obstacles and hostile environments they encounter as rapidly as possible. When things do slow down it is often detrimental to characters, forcing the audience to will them on further and as such the film is constantly engaging and compelling. Occasionally to reinforce the sense of speed, the train itself is portrayed speeding through the snow covered landscapes. While such scenes are wonderful in depicting urgency and momentum as well as global warming anxieties, they also highlight some quite unrefined computer imagery which detracts from their purpose. However the sheer pace of Snowpiercer is astounding and, alongside the visually stunning and intellectual themes featured within, the sci-fi epic is a heart-pounding experience. 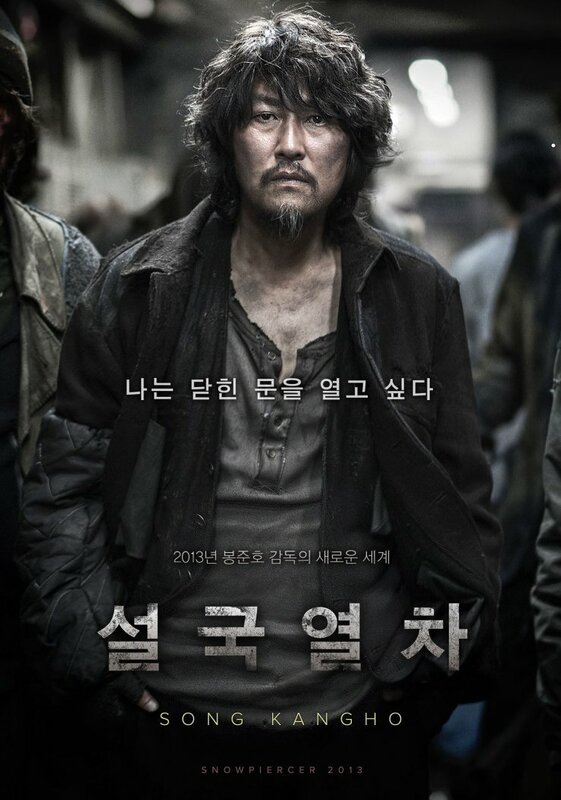 Based on the French comic book series Le Transperceneige, director Bong Joon-ho’s Snowpiercer is an enthralling viewing experience. The science-fiction epic about the last vestiges of humanity is a brilliant exploration of the unfairness of the class system, conveyed with stunning visual and spatial prowess throughout. The all-star international cast are perfectly suited for their roles, with Song Kang-ho and Ko Ah-seong also performing ably. The breakneck pace of the film results in little character development, yet when the themes, tensions and violence are so constantly riveting it is difficult to care. Simply put, Snowpiercer is a fantastic Korean sci-fi film.